The lowland tapir is the largest terrestrial mammal of South America and is currently listed by the IUCN/SSC Red List of Threatened Species as Vulnerable to Extinction. 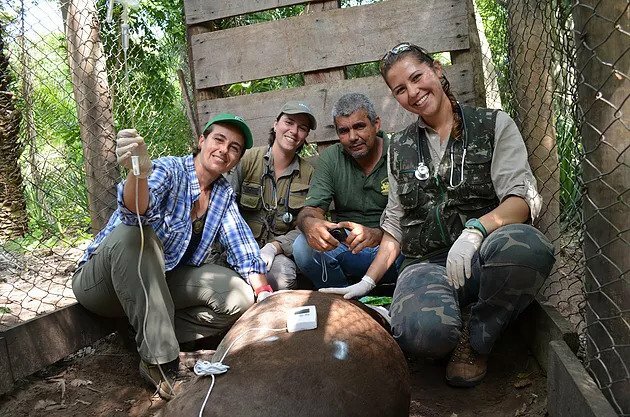 The Lowland Tapir Conservation Initiative (LTCI) is a nationwide research and conservation effort carried out under the auspices of the Brazilian NGO IPÊ – Instituto de Pesquisas Ecológicas (Institute for Ecological Research). The LTCI was first established in 1996 and since then has been using tapirs as ambassadors for the conservation of the biomes where they occur. The LTCI has included studies on tapir ecology, demography, health, genetics, habitat requirements and effects of habitat fragmentation, as well as environmental education, community engagement and habitat restoration efforts. Long-term assessments of the health of wild tapir populations in different Brazilian biomes under various levels of environmental disturbance have been an important component of the LTCI work since its establishment.